Have you ever been to the National Soccer Hall of Fame? I took a tour through it on one of my visits to Cooperstown. Its located in Oneonta, NY which is very close to the Baseball Hall of Fame. Visiting it was kind of a last minute idea. If I ever go back to Cooperstown or make my way up to Springfield, MA to the Basketball Hall of Fame, I’ll have to stop in Oneonta again. The National Soccer Hall of Fame has a giant soccer ball bursting out of the side of the building. 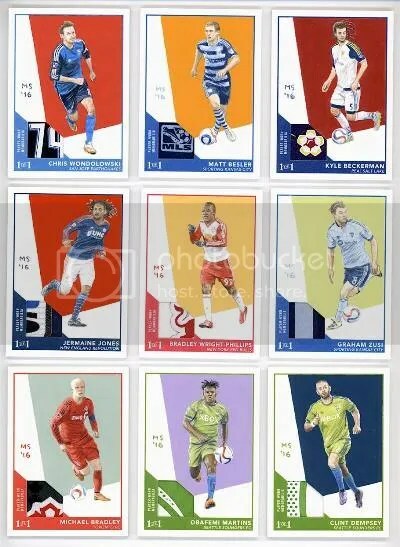 Collectors opening boxes of 2017 Topps Major League Soccer will quickly notice a design overhaul compared to previous releases. The best way for me to describe the base set is by calling it a clean white glow look. I like it. The color of the glow changes with the various parallels. An entire base set consists of (190) cards. Parallels you can pull include Blue #’ed/99, Orange #’ed/25, Red #’ed/10, and Black #’ed/1. 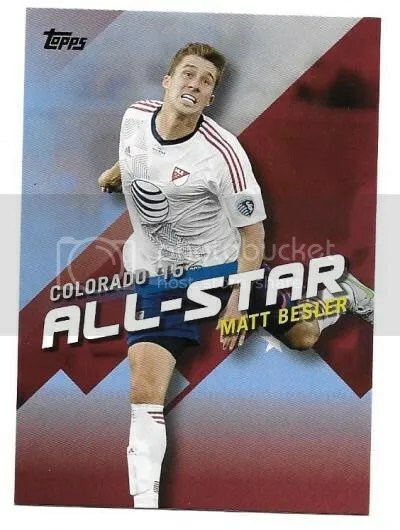 This product also debuts cards for the Atlanta United and Minnesota United Football Clubs. For the most part, Topps made it easy to spot the photo variations. Variations have different card numbers compared to their base counterparts. These too have Orange, Red, and Black parallels. 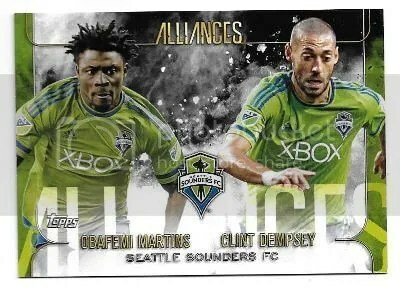 Sebastian Giovinco, Clint Dempsey, and David Villa have photo variations, but their card numbers mirror the base. 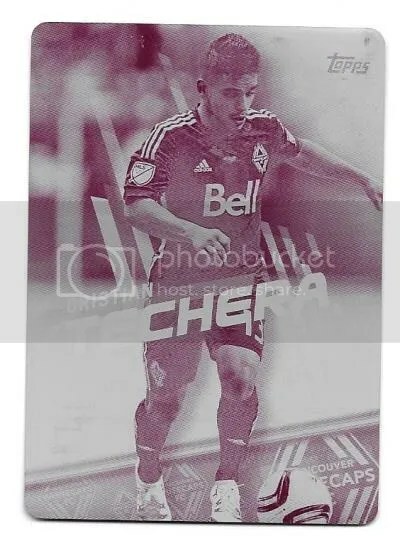 Sebastian Giovinco’s variation pictures him in a white jersey. 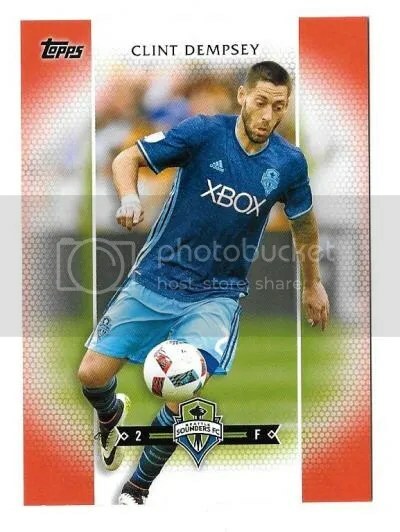 Clint Dempsey’s variation has him in a blue jersey. 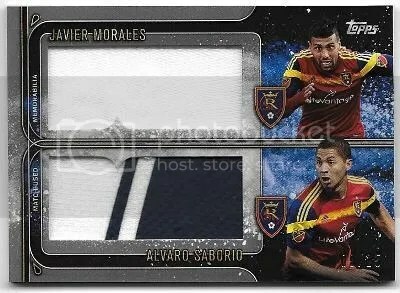 David Villa’s variation has a dark blue jersey. Every hobby box promises (2) autographs and (1) jumbo relic. 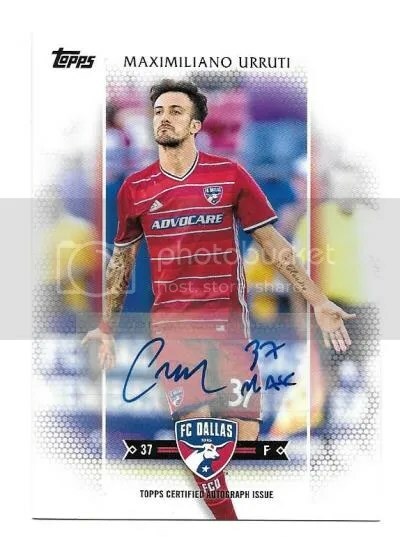 Inserts include Back of the Net, Faces of the Franchise Autographs, Give + Go, Museum Collection Signature Swatches, Throwback Topps, and Throwback Topps Autographs. All have their good share of parallels. The 1987 Topps Baseball design sure is getting it’s share of coverage this year. Rightfully so, given that its celebrating it’s 30th anniversary. 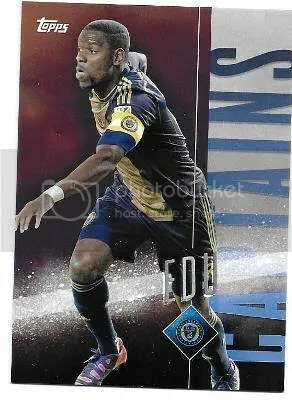 Applying that design to soccer cards looks cool. These are probably my favorite cards in the entire product. Something that I miss are the sketch and hand-drawn art patch cards. These were found in the last two iterations of this brand. 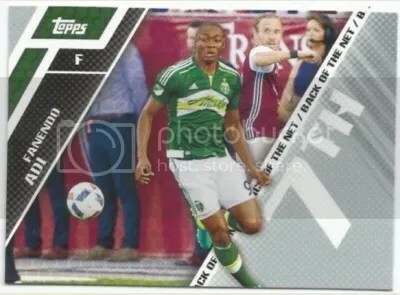 Monty Sheldon’s contributions to the 2015 and 2016 sets were great. I’d like to see those comeback. 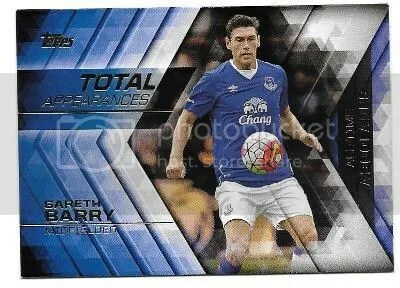 In honor of Leicester City overcoming the 5,000-to-1 preseason odds to clinch their first Premiere League title, lets dive into the latest soccer product from Topps. It may not be English soccer, but it still counts. 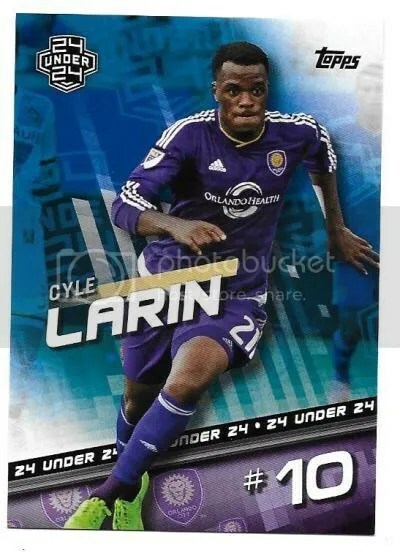 The base set contains (200) cards. Its packed with veterans and rookies. 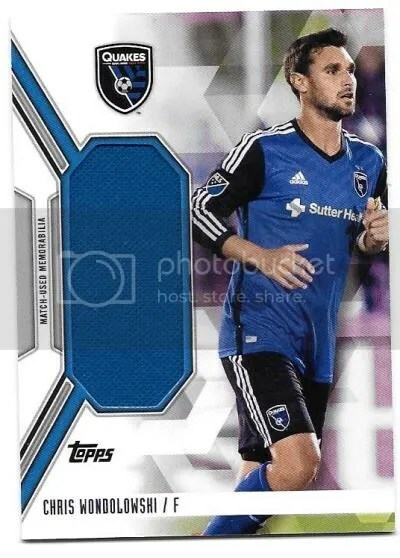 One of the newest inclusions is the first MLS card of Frank Lampard. His stuff is immensely popular. 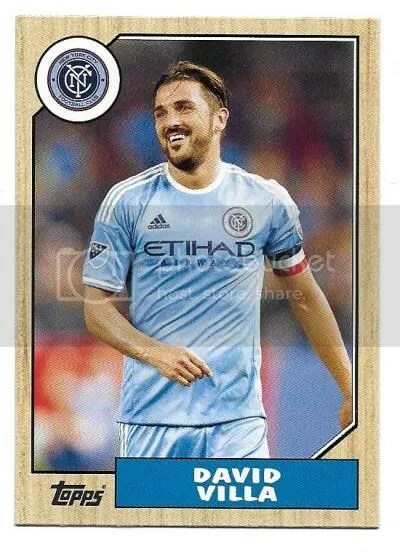 Lampard left Manchester City to come play for the New York City FC last year. Like a lot of flagship products, you’ll find some short print photo variations. In all there are (10) of them. 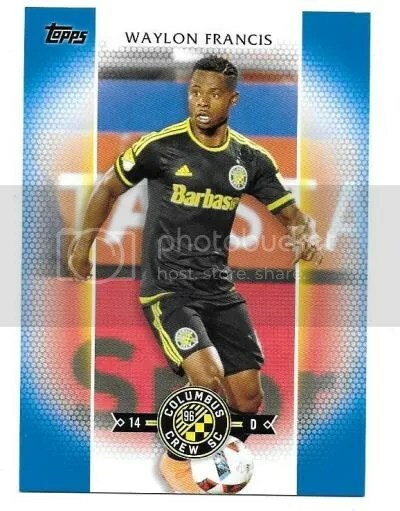 Topps didn’t put anything on these to indicate that they’re a photo variation. They look and feel like a regular base card. Printed on the back of every card is a small code. 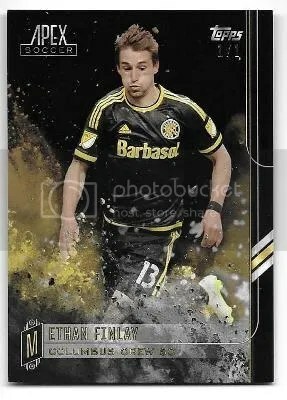 Sometimes Topps will change this code and it will differ for the photo variations. Not here. Photo variations and base cards have the same code. I did find one shortcut though which doesn’t involve you checking every single base card. I pulled (3) photo variations from my box. Each one was face down in the pack when I opened it. 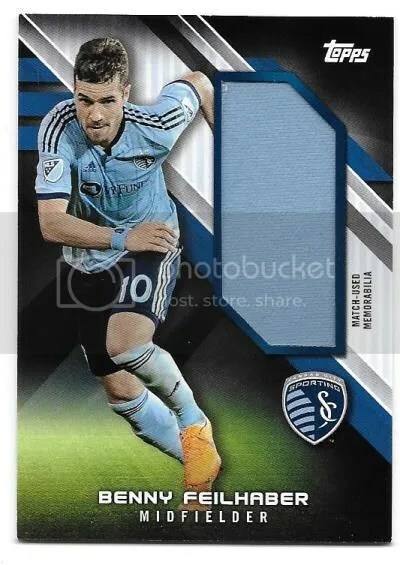 So, if your going through a pack and you find a card face down and it isn’t a “hit”, there is a good chance its a photo variation. 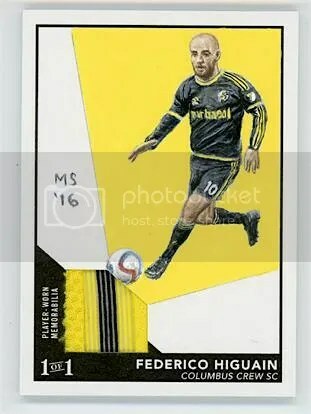 Gypsy Queen isn’t the only product now with hand-drawn sketch cards featuring a multi-colored patch. This product has them too. I’ve only seen one popup, and it was a redemption. 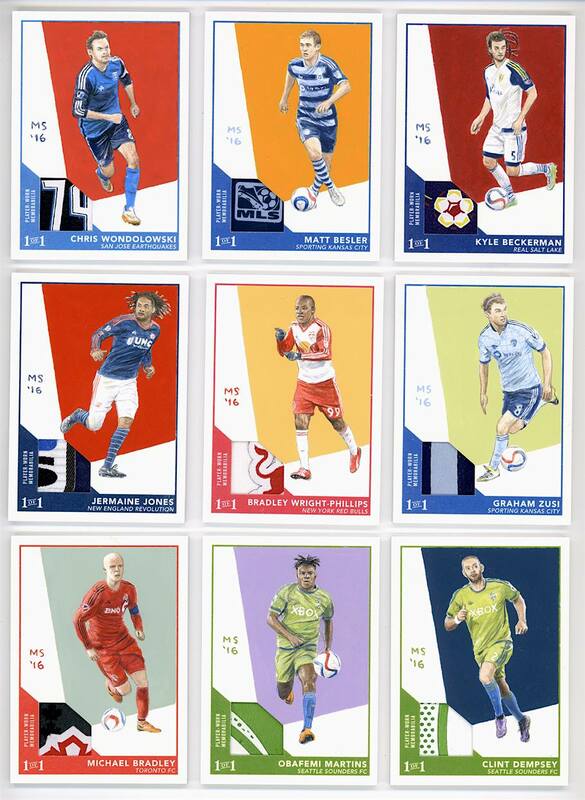 The artist(s) may not have returned them to Topps in time. It will be interesting to see what these actually look like. I enjoy anything hand-drawn that’s combined with an autograph or relic. 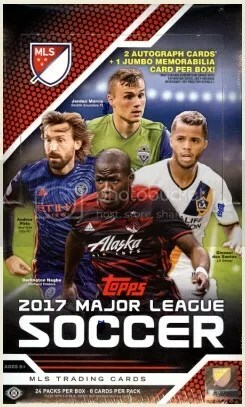 Between the box I opened and some of the other breaks I’ve seen, 2016 Topps Major League Soccer seems to be quite solid. 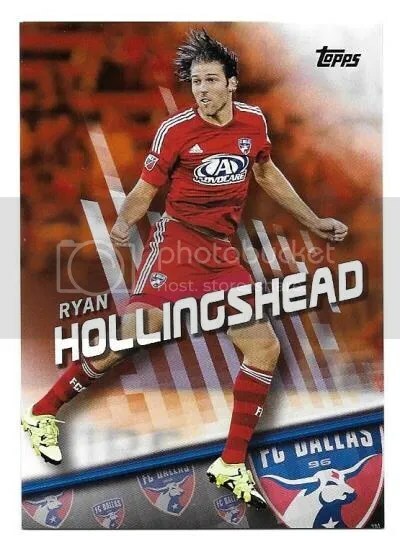 Even if your not a huge soccer fan, but looking for a box to bust, you may want to give this product a chance. It can pack quite the punch for a flagship brand. Granted, not every box will yield the pull of a lifetime. But I think it has a great shot at being decent. You’re promised (2) autographs and (1) jumbo relic per box. I only pulled (1) autograph. 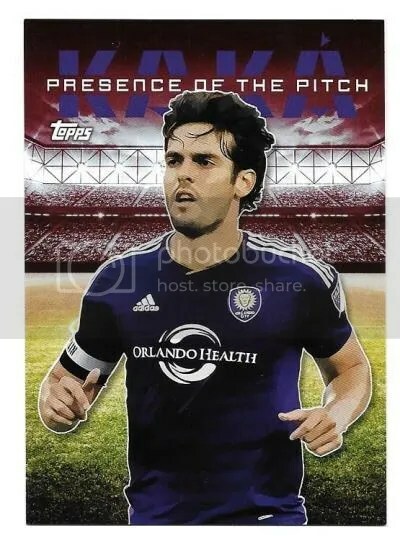 But the printing plate and Kaká red parallels made up for it. Time for some tea and biscuits with the Queen! We’re heading across the pond for this quick 2-pack break. Have you ever wondered what the Queen carries inside that little purse of her’s? I bet she’s got a few packs of 2015-16 Topps Premier Gold in there. To make this write-up a little more enjoyable, try reading it in a British accent. When it comes to soccer (football over there) I’m far from an expert. But sometimes its fun to try something outside of your normal element. I attended one soccer game in my life and that’s when the Hershey Wildcats were still around. The first thing I notice when I look at any of the photos is the size of the corporate sponsor’s logo on the player’s jersey. They’re huge. Way bigger than the team’s logo. Its probably been this way for years, but to a nontraditional soccer fan its just something that jumped out to me. Die hard soccer fans probably think I’m stupid for even mentioning it. 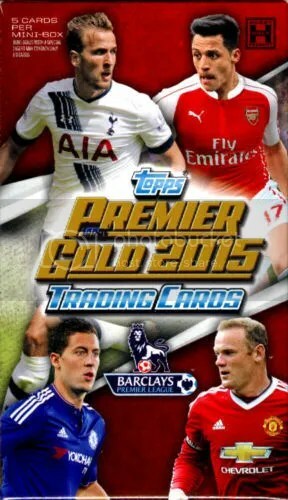 2015-16 Topps Premier Gold is a high-end soccer product. 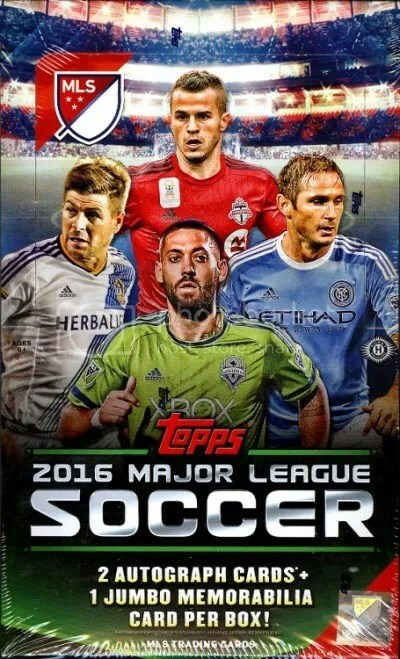 Given that the set covers the Barclays Premier League, popularity in the United States might not be the highest. A full box contains (10) mini boxes. Inside each mini box you’ll find a “hit”. 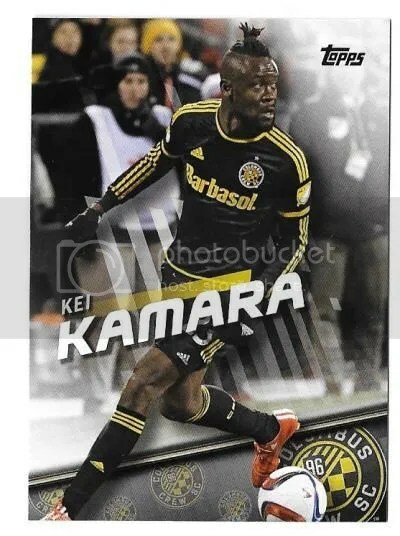 The card stock is thick, and the photography reminds me of something you’ed see in Stadium Club. A complete base set has (150) cards, and comes with a slew of parallels. No on-card autographs here. All stickers. 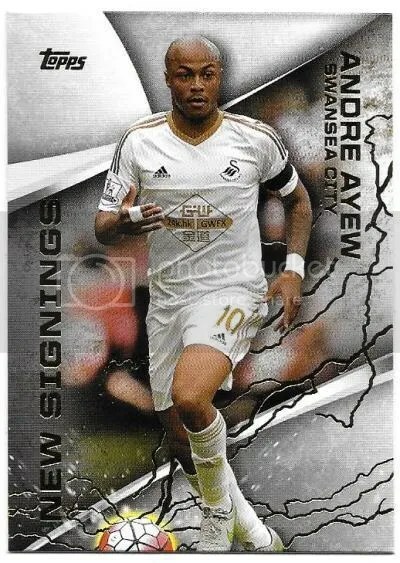 I like the look of the Golden Boot Die-Cut Autographs. 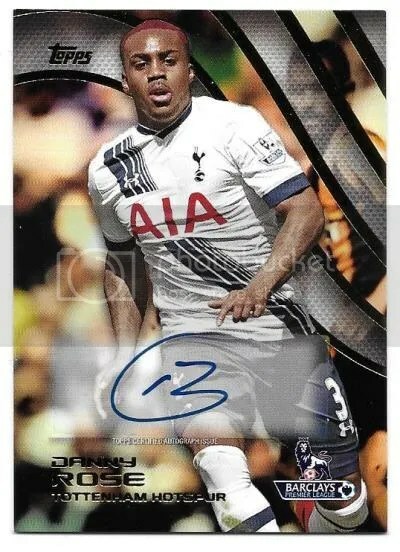 A collector recently spent $1,000 on a Wayne Rooney from that set. 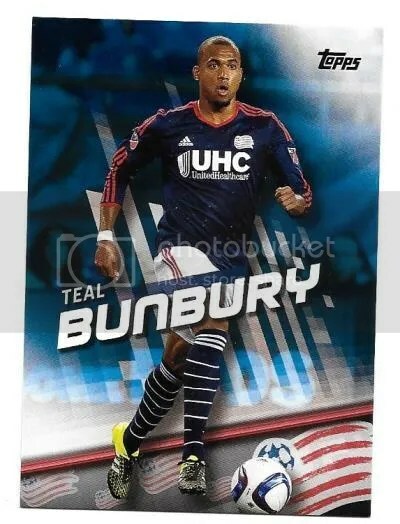 Soccer cards can provide some interesting patches, but for the most part you’ll likely get one colored jerseys. 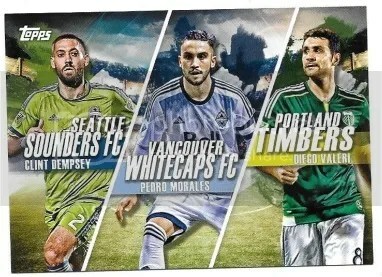 The New Signings insert looks cool with their lightning spewing soccer ball. 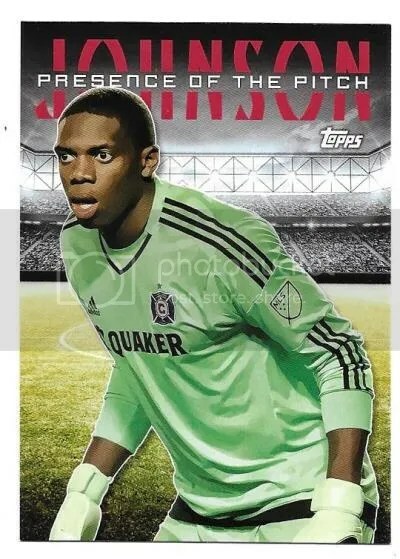 I think this is about as high-end of a product that soccer really needs. For a couple of packs it was a fun rip. 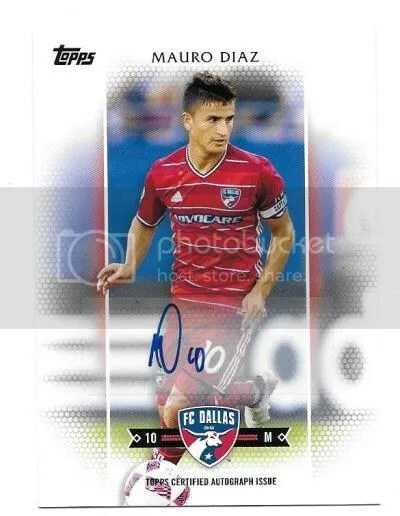 This contest is for a Dillon Powers 2015 Topps APEX Soccer Auto. Good luck!!! This contest will end Monday, October 5, 2015 @ 8:00 p.m. EST. I don’t care if you’re a soccer fan or not. I think we can all agree that $45.00 for a hobby box which guarantees (2) autographs and (1) relic is a darn good deal. Most of us have spent much more on other products and have received a lot less. 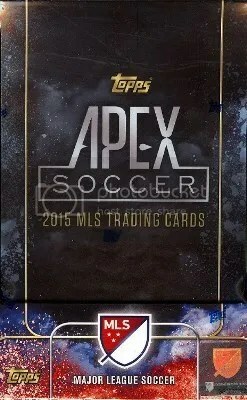 Just for the average box breaker looking for something to open, 2015 Topps APEX Soccer is one option they should look into. Not only do I like the price, but the way the product is configured is attractive too. 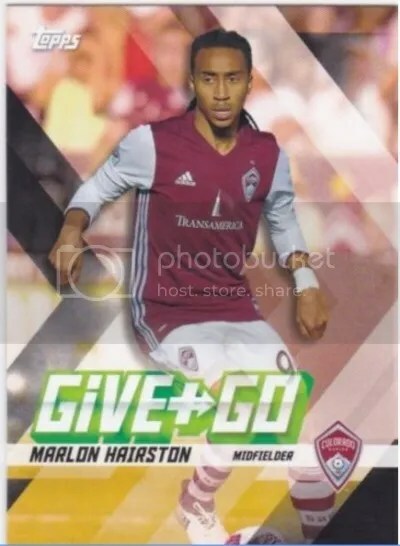 Boxes only contain (2) packs each housing (32) cards. It gets straight to the point quite fast. I wish more products were configured like this. 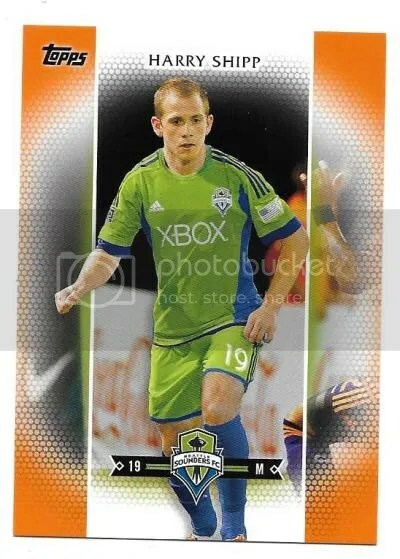 From a design perspective, the base set looks like a cross between Topps Fire and Valor. 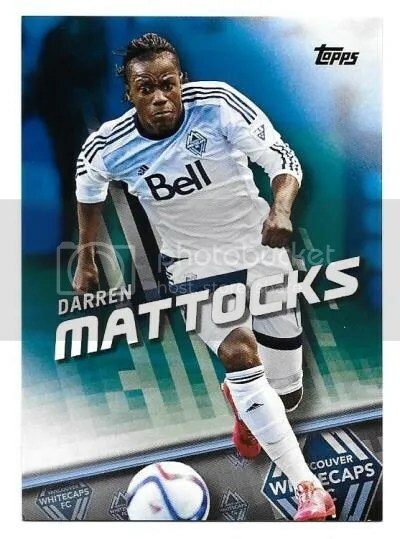 I’d like to see Topps make the player’s picture a bit more artistic rather than just the background. The painted look has always been a winner for me. The overall set consists of (110) cards. The last (10) are short prints. 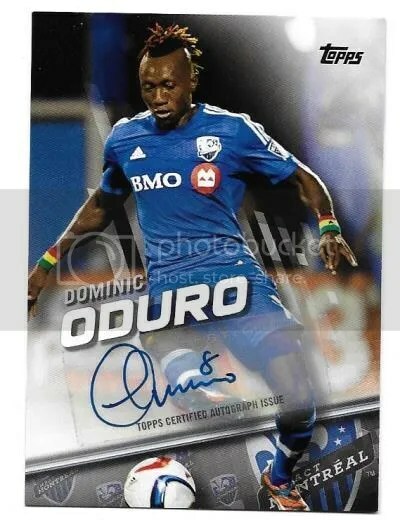 I think the only drawback is that the autographs are on stickers. 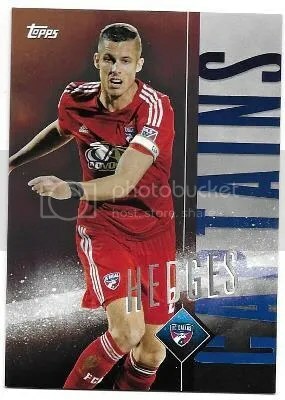 Out of all the autographs, relics, and parallels, I enjoy the look of the Match Day die-cut auto/relics. 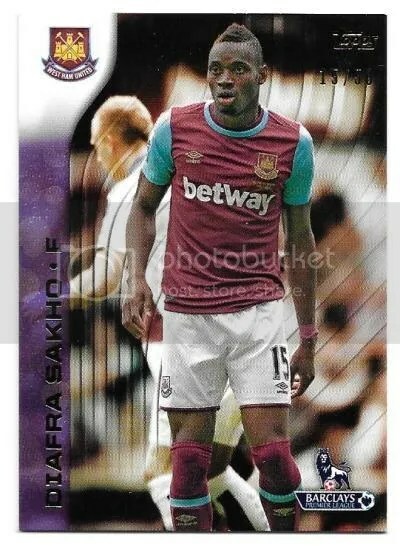 The soccer balls used for these cards offer some nice looking multi-colored pieces. Plus for any of you math nuts out there you’ll realize they look like a parallelogram. And yes. There are parallels of these tiny parallelograms. Its parallelception! I’m not a huge soccer fan, but who could pass up a deal like this. 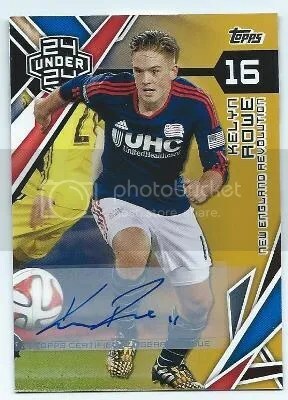 The price is what really drew me to 2015 Topps APEX. For the low cost you get some high-end looking stuff.